We missed our regular Sunday lunch review spot so much that we've embarked on a new search, for the best brunch in Cambridge. We've got a long list. And we're working our way through as many brunch spots as possible to find the perfect weekend breakfast. We'll be reviewing cafes, pubs and restaurants to find the best brunch in Cambridge. Our score will take into account the essential elements of the weekend brunch: Coffee (and other beverages); atmosphere and service; range and suitability of menu choices; the quality, size and value for money of the brunch dishes; and the all-important accompaniments and condiments on offer. Today's #CamBrunchReview visit made for a sophisticated start to the weekend. 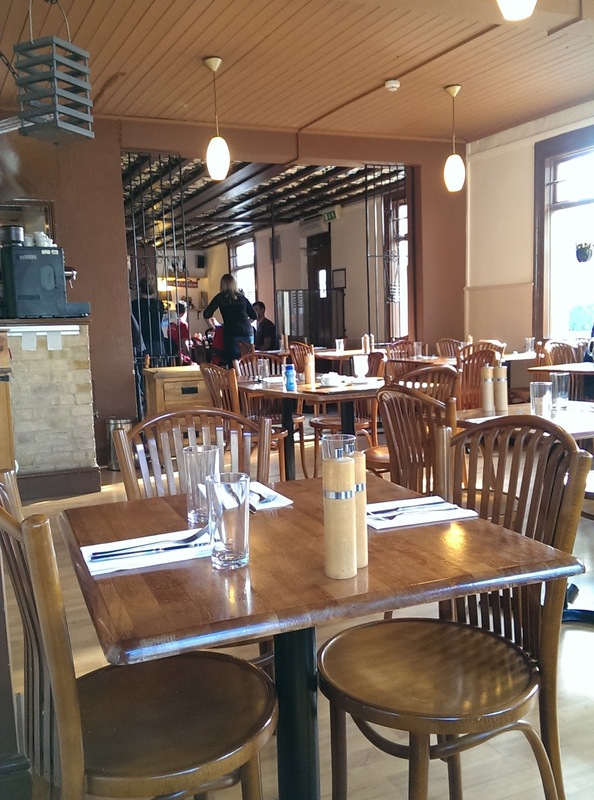 We went for a Saturday brunch at the much-loved and long established Backstreet Bistro on Sturton Street. Weekend brunch is a "thing" here, recommended by a number of different people who had spent many a happy Saturday or Sunday morning devouring big breakfasts and feisty cocktails at this little neighbourhood restaurant in the Mill Road area.  The restaurant is well known both with locals and those from further afield for its low-key sophistication and menu of traditional British and European dishes. It is the kind of bistro that gives you diner envy when you pass on a cold evening and catch a glimpse of couples at candlelit tables sipping big glasses of red wine. Sitting on a sunny corner of a quiet residential area, and exuding a continental charm usually found in little family-run joints in France or Spain, visiting Backstreet Bistro feels a bit like being on holiday. Weekend brunch is served from 10.30 to 2.30pm on Saturdays and until 12.30pm on Sundays, and the extensive menu seemingly covers all brunch bases. The hallmarks of a successful brunch are all there: coffee, an array of classic cocktails, an offer of newspapers to peruse whilst "relaxing or recovering", and a substantial offering of home-cooked food. The atmosphere was certainly relaxing, despite the rather depressing choice of music blaring out above our table, but sadly the newspapers never materialised. But, who cares, we were there for the food. 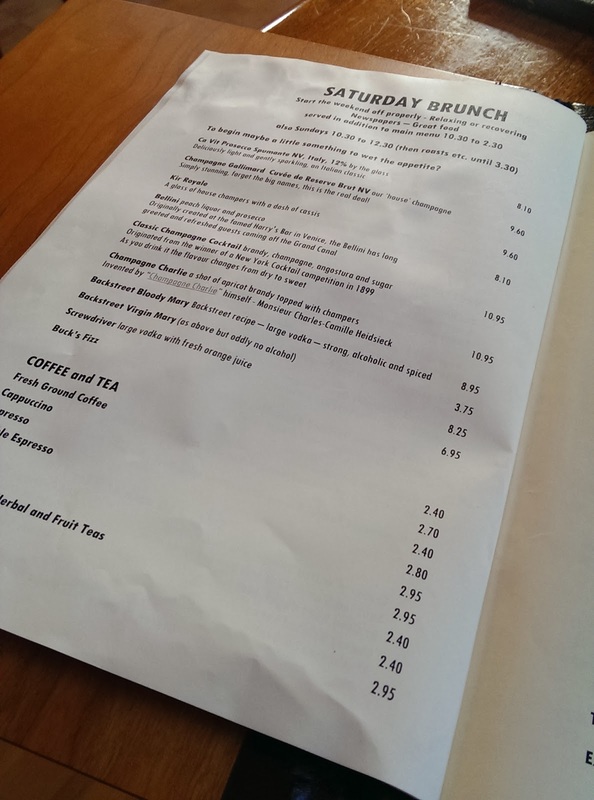 The menu features some classic options such as Manx kippers and poached eggs, a monster full English, bubble and squeak, eggs Benedict, and French toast, alongside some interesting additions. A nod to the Dutch population of Cambridge, the spiced ham, eggs and tomatoes on toast (known as Uitsmijter) sounded intriguing. Homemade goodies such as potato scones and cheese and ham croquettes sounded equally impressive. We liked the presence of some atypical brunch options - not everyone wants bacon, right? - including a full-on steak sandwich, burger and fries, and steak and eggs. We were so hungry by the time we had made our way through the menu that even the Scotch porridge oats with a wee dram on the side began to sound tempting. We made an error immediately and opted for coffee over cocktails. Fresh coffee it may have been but it was watery and weak and far from the caffeine injection required to kick start the weekend. The cocktails, on the other hand, are renowned for being on the strong side! I had my eye on the Champagne Charlie (a shot of apricot branding topped up by Champagne) for our next visit, and the bistro's secret recipe Bloody Mary is meant to be really something (but don't make plans to drive, operate machinery, or, er, achieve anything for the rest of the day!). The food more than made up for the disappointing start. A huge full English breakfast (at £9.25) served with a slice of toast and butter brought a smile to our faces. Two generous sausages, made locally according to a special Backstreet Bistro recipe, were rich, herby and slightly smoky with crisp skin. Two rashers of dry cured bacon curled at the thick, golden brown edges of crispy fat. 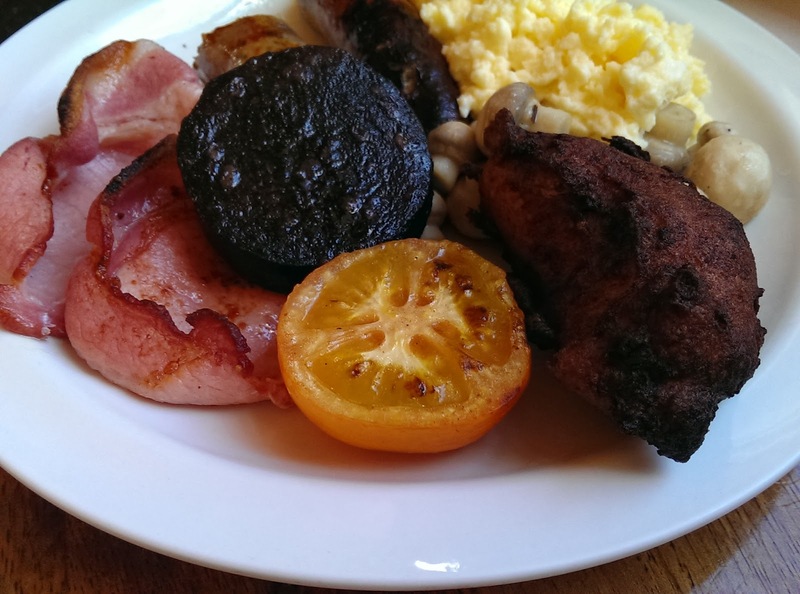 The plate also featured a good slice of black pudding, scrambled eggs, and a near-burnt and oddly shaped potato fritter. Hiding beneath were a small and uninspiring pile of tinned button mushrooms (a cardinal sin on any breakfast plate) and an anaemic fried tomato (perhaps we weren't on a street corner in a village on the Med after all). Inconsistencies aside, it was certainly a satisfying way to start the day. 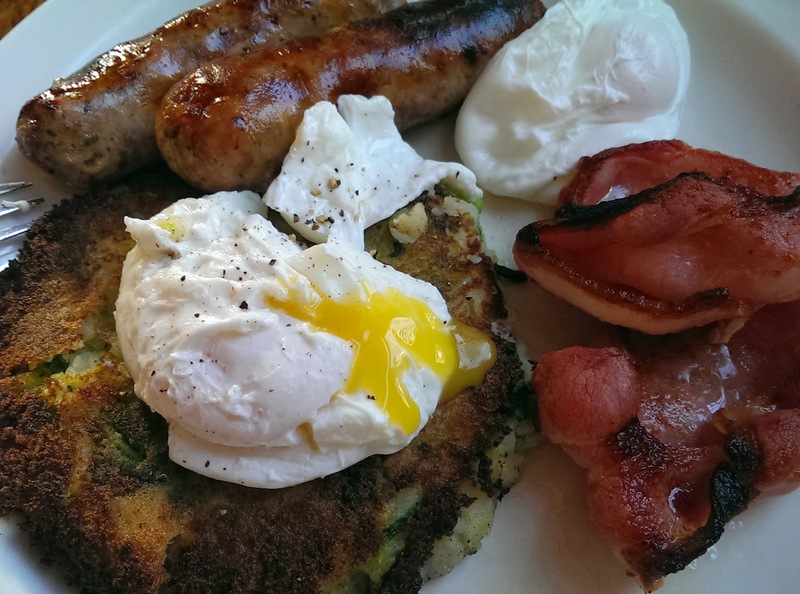 Another hearty dish hit the spot, featuring the Backstreet Bistro's three B's: bangers, bacon and bubble 'n' squeak, topped with a couple of poached eggs (also £9.25). Two sausages, made to the same special recipe as those in the full English, proved to be too herby for me for a breakfast dish. The two rashers of bacon, however, tasted delicious with the huge helping of bubble 'n' squeak; even better with the runny yolk of the perfectly poached eggs soaked up by well seasoned and fluffy potato. Now and again a tasty little fleck of the charred coating of the fried cake combined with the soft, smoothness of potato and finely shredded cabbage and onion to add some bite. It was good, incredibly moreish, and was more than enough food to set me up for the rest of the day. We lingered over our almost empty plates, then over drinks, and felt thoroughly chilled out afterwards. Our verdict: Backstreet Bistro's prices might mean that this weekend brunch needs to be saved for special occasions. But brunch here is actually a very laid back and relaxing affair, with hearty fare and big portions that provide good value for your money. Service is friendly, efficient and non-intrusive, making for the perfect atmosphere for a long lazy (maybe boozy) brunch. When to go: Saturday morning was superbly chilled out but we suspect Sundays are busier so reservations are recommended. 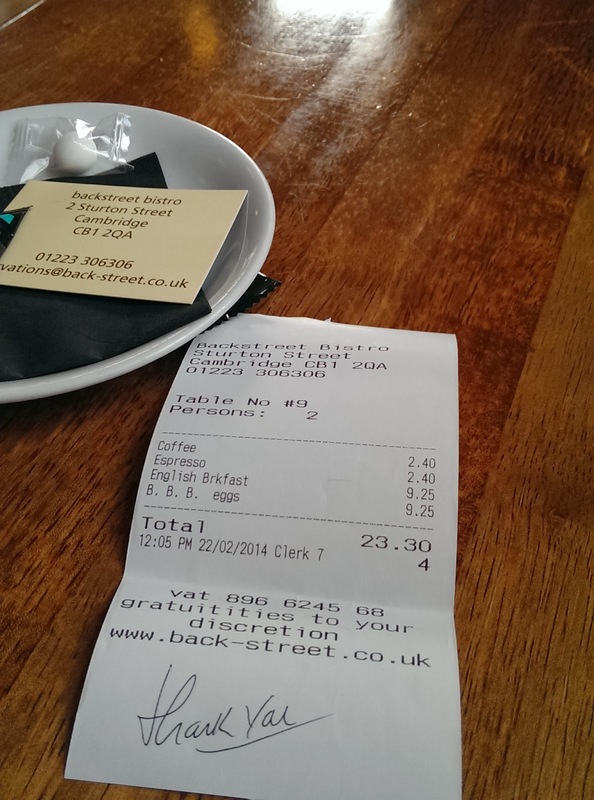 Go to Backstreet Bistro for a real treat when you've got a lazy weekend stretching ahead of you. Our rating (1 being BAD and 5 being PERFECT! ): 3 out of 5. 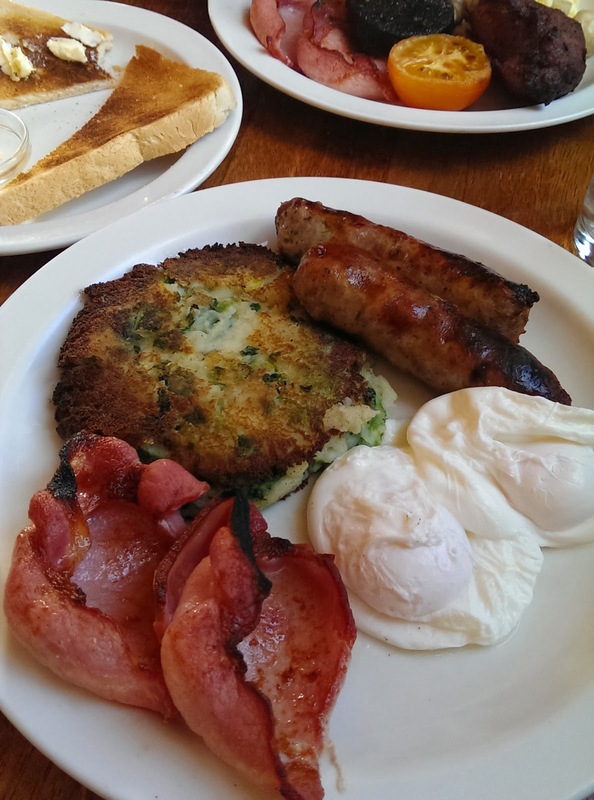 You might also like Weekend Breakfast at Fitzbillies.